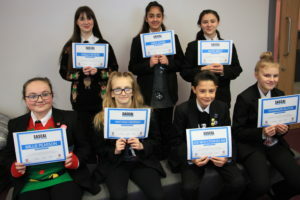 The Co-operative Young Leaders Programme was created in May 2011 and has been a very successful programme for both our students and our partner primary school pupils. The programme offers students in Years 7 -11 the opportunity to learn and develop skills such as; communication, organisation, planning and delegation. It develops confidence, self- esteem and it encourages teamwork due to the fact that students are asked to teach peers and Younger pupils. You can see all of our excellent work updated daily on our Twitter account @CYL_CAS. The Co-operative Young Leaders programme has been recognised and rewarded as part of the winning Regional Character Awards 2016 and The Co-operative Solidarity Award Winners 2015. 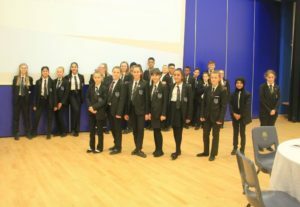 There are over 100 trained leaders in Years 7-11, leaders have been trained generically in leadership skills and students may then choose different projects within a year, such as Modern Foreign Languages, ICT, Reading, Literacy, Olympic Lessons and Science. Training to be a Co-operative Young Leader takes place as part of the Academy Extras programme, where students learn how to work as a team, develop their presentation skills and learn how to organise small groups. Planning for all the different projects also takes place within the Academy Extras Programme after-school club, students learn to write their own lesson plans, PowerPoint presentations and lesson organisation, plan their delivery of the topic and create certificates for presentation at the end of each lesson. Develop and create responsible, organised, motivated and confident students who can lead and deliver purposeful and enjoyable academic and sporting activities. Encourage students to get involved in organising and assisting with the provision of learning on a voluntary basis. Provide opportunities for primary children to benefit from working with the Academy leaders. 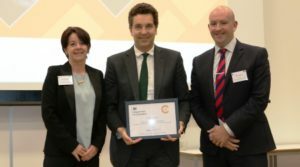 Develop our partner primary schools links ensuring a smooth transition for pupils from Key Stage 2 – Key Stage 3 Personal development – helping people reach their full potential. Provide a stepping stone to further or higher education and employment for students. Trained leaders have many opportunities to develop their confidence, self-esteem and presenting skills. Leaders are often asked to present to visitors, such as the picture above showing the CYLs presenting an after school staff inset to members of the SACAL group. (Reverse Advent organised and ran by CYL’s). The leaders are always involved in delivering events such as Arts and Book evenings, Primary School discos and many more transition events. 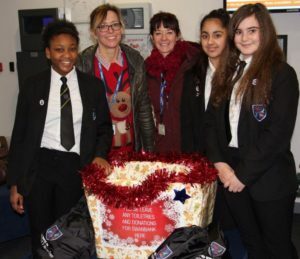 We have a Parents Teachers Friends Association and leaders ensure that all events are well run, volunteering at events, serving drinks, delivering activities and chaperoning members of the community. 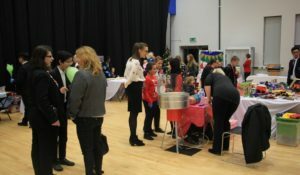 (Christmas Fair led by CYL’s). Leadership takes many forms and once trained the students can choose to become Sports leaders, ICT leaders, Reading Buddies, Modern Foreign Language leaders and we even ensure the values of the Co-op Trust are embedded by training students as Fair-trade Leaders. Logos – We have our own CYL logo as shown on the leaders’ badges. Badges – Leading on from the logos, we have badges to identify who are the Academy’s Young Leaders. Stickers and Certificates – These are awarded to pupils who come from the primary schools. They also have the CYL logo on them. Accreditation of the Leadership Programme is integral to ensuring that students feel valued and rewarded for their efforts. The Co-operative Young Leaders have volunteered a great deal of their own time throughout the projects. Recognizing and rewarding students is very important at the academy and therefore an internal accreditation system has been developed and leaders are given the opportunity to gain certificates and aim for more success. Leaders are awarded certificates and badges in celebration assemblies throughout the academic year. All active Co-operative Young Leaders are presented with a CYL badge to represent their dedication to the programme.